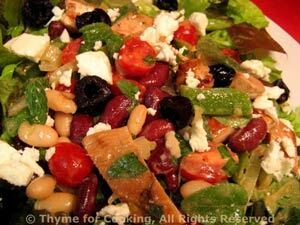 Thyme for Cooking Dinner tonight: Salad with Turkey Beans and Feta. We can get turkey cutlets which are thinly sliced (about 1/4", .6cm) and have them a lot in the summer. I know they are not available in all markets. If you can't find them, get a turkey tenderloin and either have the butcher slice it or do it yourself, freezing part of it for later uses.